Sleek, shiny, and bright red, Radio Flyer Wagons have been a classic children’s toy for generations. It’s not just their looks or durability that has made them so popular (although these aspects certainly don’t hurt!). Instead, it’s the amount of freedom they give to kids and parents. There’s no end to the places you can go as a family when you have a radio flyer wagon with you. Going to the park as a family is a fun way to spend a sunny weekend afternoon. If the park is just down the street, then it can be fun to walk down together and get some exercise at the same time. Of course, it’s likely that you will want to bring snacks, games, and other items along with you. Radio Flyer Wagons give you a handy way to store and transport all those Frisbees, juice boxes, and soccer balls that you need to make a trip to the park complete. And when you’re done at the end of the day and the kids are tired, you can load them up too and head back home. Sometimes a little off-roading can be really fun. Going to the beach with Radio Flyer Wagons makes moving your child easy and fun for both of you. The sturdy tires that these wagons are known for are more than a match for a sandy beach. Your little ones will love being able to play with these outdoor toys once you reach the shoreline. Many Radio Flyer models come with cup holders so you can be sure that your children stay hydrated. And some even come with UV protection canopies to shield kids from the sun once they’ve had enough sunshine. If you’re going with your child for a play date, a bright red wagon is a fun and flashy way to show up. Kids of many ages are able to ride in these wagons. They are big enough to hold your child and a friend or two, and the Comfort Embrace wagon is specifically designed for babies with a removable, cradling infant seat with five-point safety harness, and has room for an additional child. Who says you have to leave home to have fun? Radio Flyer Wagons are great to play with in the backyard. Boys and girls love playing with wagons, and having one at home will allow them to imagine grand adventures for themselves without leaving the safety of the backyard. If mom and dad enjoy working in the garden, kids will love to help out with a Radio Flyer Wheelbarrow. They can also help with small chores by transporting items with their wagon. Whether they’re playing with their friends or helping out in the yard, your kids will have tons of fun. No matter where you want to go with your children, Radio Flyer Wagons are a great way to get there. They’re safe and comfortable for your children, and their classic builds make them instantly recognizable to anyone you pass. For a flexible and fun new toy, these wagons are tough to beat. When kids would like a bit more independence, there’s also a wonderful assortment of trikes and bikes by Radio Flyer. Morgan Cycle Retro Tricycles: Your Child Will Ride in Style! Tricycles are a cute and fun way for your child to zip around, but there are ways to make the ride even more fun. Enter Morgan Cycle Retro Tricycles. These tricycles are absolutely adorable, reflective of days past while providing kids with today’s quality and safety. What are Morgan Cycle Retro Tricycles? Simply put, these tricycles are vintage-style trikes. Just like the vintage bikes mom or dad might ride, these trikes emulate the styles, colors, and curves of older bicycles. They ride smoothly while looking great, making sure that your children will be the talk of the neighborhood. There are a number of different styles and colors for you to choose from, but at its core is a sleek, curvy design that you don’t see very often these days. Added to this are bright, beautiful colors painstakingly applied to handcrafted steel and chrome trim, giving you a trike that’s hard to miss. Both boys and girls will be able to find colors and styles they love. For preschoolers who love pink, there are two options – Pink Pegasus (a lighter shade) and Pink Fairy (a darker shade). But that’s just the beginning. There’s also a beautiful lavender model, a daring red trike, and a classy silver trike. For the most extreme style, the Hot Rod has a black base covered with flames. No matter what your child’s preferences are, there’s a color and style that will suit them. Every little detail of these trikes has been thought of. Besides the solid build of the steel frame, there are numerous other considerations included to ensure your toddler’s comfort and safety. One of these features is a battery operated LED lamp. This light attaches to the front of the trike to improve your child’s visibility. He’ll also be comfortable on a leatherette padded seat. The handlebars are adjustable to get the best fit for your child’s height. The rubber tires are solid and provide added stability and safety on a number of surfaces. Morgan Cycle Retro Tricycles are built with children's safety in mind. To that end, they’re carefully crafted with child-safe, non-toxic coatings. The rugged tires are rubber with ball bearing steel, making for a smooth ride that’s easy for your child to control. Because the handlebars are adjustable you’ll be able to make sure you get a perfect fit, another way to help keep your child in control of the trike. While trikes aren’t anything uncommon these days, Morgan Cycle Retro Tricycles are a gorgeous way to bring back an old favorite. These cycles are both attractive and safe, allowing kids to flaunt their individuality while still having a ton of fun. In addition to these fine trikes, Morgan Cycle also makes a fabulous selection of bicycles, scooters, wagons, and even an officially licensed Lionel pedal train, all available at A Kid Place. Do your children love imaginative play? Most kids do. Boys and girls love playing games that let them dream about what their lives might become. Playing house, pretending to do adult jobs, and acting out scenes from their favorite books or movies help kids grow their minds and their imaginations. Imagine if you could give your child a place all her own to live out her fantasies. With Kidkraft Playhouses you can do just that. If you give your child a Kidkraft Playhouse you’re giving her a space of her own where she can safely spend time by herself or with friends. These outdoor houses are perfectly sized for your child and include many of the things that you’d find in a life-sized cottage. Each house has a sturdy roof, strong walls, windows, and doors that open and close. These houses are built to last, with weather-resistant wood and sturdy construction. Your child can go a long way with her imagination, but sometimes a little help is nice too. That’s why Kidkraft Playhouses include a number of child-size fixtures to explore. 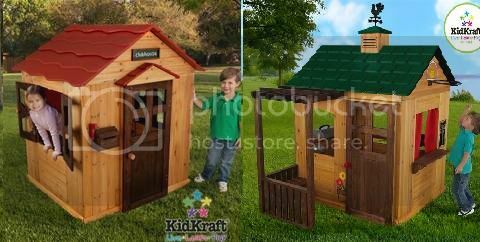 The two different playhouses each have something different to offer. Outdoor Cottage: This is a sweet little cottage that would fit perfectly in even small backyards. It’s big enough for your child and a few of her friends to play in. Inside she’ll find a sink and storage space to keep her treasures in. Outside you’ll find a little mailbox perfect for passing notes and letters (there’s even a flag to let her know when there’s a message waiting for her). Activity Playhouse: For an even bigger house, the activity playhouse is the way to go. It has plenty of space for your child and his friends and a number of fun additions for him to explore. There are plastic bins for playing with sand and water, a basketball hoop for impromptu games, a “grilling area” for barbecues, a puppet-show window complete with curtains, and even a patio area for relaxing. All of this fits in a cabin that would fit in all but the smallest of backyards. Rough play can take a toll on outdoor toys, but Kidkraft playhouses are built to withstand abuse from both your children and the elements. They’re securely built with weather-resistant wood and can stand up to whatever your children throw at them. All of the finishes used in their construction are non-toxic and lead-free, so you can be sure that your kids are safe while they play. There’s really no substitute for a special place for your kids to spend time with their friends. A Kidkraft playhouse will let them have space of their own without having to leave the backyard. There’s no end to the places they can go with their imaginations with one of these high quality playhouses. You can find these awesome playhouses at A Kid Place, along with an impressive selection of outdoor toys including sandboxes, tricycles, pedal cars, wagons, scooters and more, all sourced from award-winning manufacturers. Did you ever have a rocking horse growing up? Chances are you spent many hours as a child rocking back and forth on a rocking toy. Kids love the feeling of movement and the imaginative adventures they can have on the back of these classic toys. 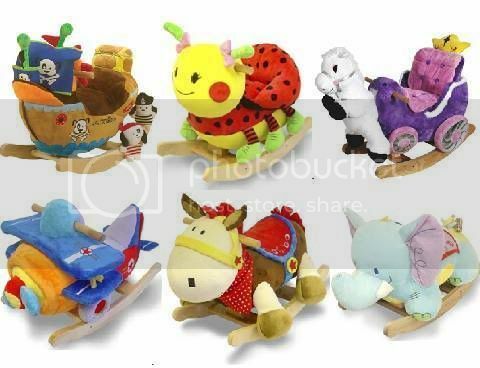 Rockabye Rockers are giving rocking horses a face-lift, combining fun movement with whimsical colors and characters. They’re a great way to introduce your children to a toy that generations have loved. What Makes Rockabye Rockers Special? The thing that gets toddlers so excited about Rockabye Rockers is their fun and friendly characters. Each character is thoughtfully made with a wooden base and handlebars, and soft plush coverings, making for a sturdy and comfortable ride-on toy. Bright colors and friendly faces make these rockers inviting and engaging for your children. Horses are just the beginning when it comes to the characters your child can meet with these ride-on toys. There are over a dozen different plush rockers you can choose from to introduce to your baby. Does your son or daughter love bugs? Then Gregory Grasshopper or Lulu Ladybug would love to make their acquaintance. Does your little one love trucks, planes, and other types of transportation? Then he would have hours of fun riding a rocking bi-plane airplane or a fire truck rocker. Kids that love to imagine great adventures for themselves will have a blast aboard a pirate ship or princess carriage rocker. There’s even a colt horse for those who love the classics. Alongside the unique and engaging characters, Rockabye Rockers provide a safe, high quality experience for your children. These wooden baby rockers are made in the USA and are designed to withstand years and years of lively, active play. Their sturdy construction makes them a great choice for daycare centers and waiting rooms. They’ll also be able to hold up to generations of children at home. Kids love to ride on rocking toys, but they also love to learn. Rockabye Rockers can meet both of these desires by providing an educational aspect as well. While your child is rocking she’ll be able to choose from four different songs to listen to. These songs help her learn about the ABCs, colors, shapes, and numbers. Your child will be able to turn these songs on while sitting and rocking, making it easy for her to play and learn at the same time. Rockabye Rockers provide you and your child with a delightful twist on a classic toy. Their cute, colorful characters will make excellent friends for babies, toddlers, and small children. Because they have plush coverings they’re comfortable for almost any age. The built-in educational songs help stimulate minds, combining learning and play in an undeniably fun way. One look at these adorable rockers and your child will fall in love.